Students from the following schools are invited to attend InterProfessional Student Advisory Gatherings (#IPSAG): Dental Medicine; Perelman School of Medicine (both M.D. and BGS); Nursing; and Veterinary Medicine. In addition, students from the following programs who are working in health care settings or conducting biomedical-related research are also encouraged to attend: School of Social Work and Practice; School of Engineering and Applied Science; and Pre-Health studies. Any interested student interested in a health-related career is welcome to participate. Wellness at Penn considers #IPSAG an example of Social Wellness. To learn more about #IPSAG, please read the #IPSAG Charge. For additional resources, check out the Health Sciences Student Resources Guide. 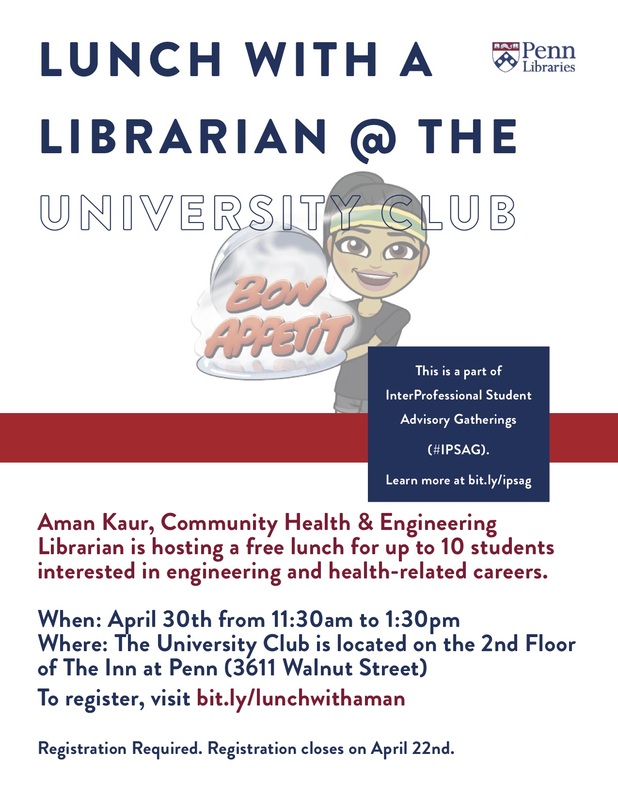 On Tues April 30th from 11:30am to 1:30pm, join Aman Kaur, the Community Health & Engineering Librarian, for lunch at the University Club. This lunch is limited to 10 students interested in engineering or health-related careers, so register ASAP! 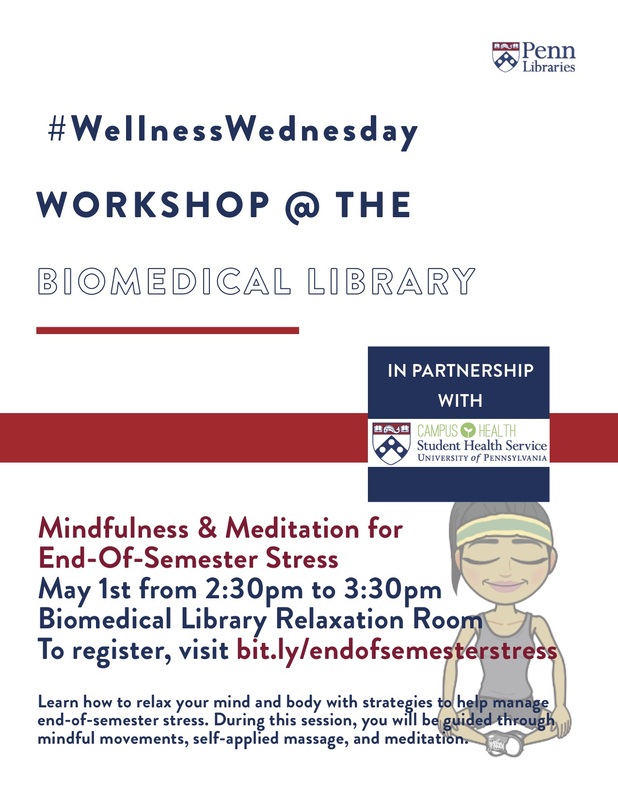 ​The Biomedical Library is hosting an "Mindfulness & Meditation for End-Of-Semester Stress" workshop in the Relaxation Room on Wednesday May 1st from 2:30pm to 3:30pm. Sandi Herman, M.S., a Health and Wellness Educator at Campus Health and Student Health Service, will guide you through mindful movements, self-applied massage, and meditation. Through feedback collected from the Center for Public Health Initiatives and various student groups at Penn, the Biomedical Library opened a Relaxation Room in the newly reopened Stemmler side of the library in late October 2018. The Relaxation Room is a quiet space intended for folks to take a break from studying and other stressful things. You are welcome to stretch on the yoga mats, do chair yoga, color, write positive thoughts, listen to soothing music, do a puzzle, squeeze a stress ball, and/or play with a fidget spinner! In addition, the Biomedical Library is looking for feedback about the Relaxation Room, so please continue to add suggestions to the Relaxation Room Wish List. On Tuesday March 19th, 2019 from 12pm to 2pm, the Biomedical Library hosted the #IPSAG Health Sciences Lunch. 76 people from SEAS, PSOM, SON, SAS, Wharton, and Vet registered for this networking event geared towards students interested in health-related careers. 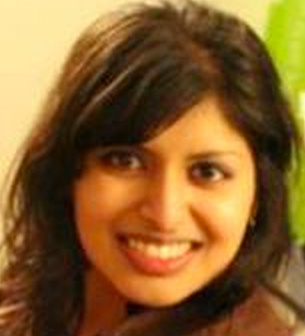 A first-year medical student presented about Walk With a Future Doc. Students were invited to participate in a feedback activity that involved suggesting ideas that would then be up and down-voted by their peers. On Friday January 18th, 2019 from 12pm to 2pm, the Biomedical Library hosted the #IPSAG Welcome Back Lunch. 126 people from SEAS, PSOM, SON, SAS, SP2, Wharton, and Vet registered for this networking event geared towards students interested in health-related careers. Library staff mingled with students to learn about students' needs and wants regarding library spaces and services that can support their academic and non-academic interests. Several students mentioned the difficulty of finding a quiet 24/7 study space both on and off campus. On Tuesday December 11th, 2018 from 12pm to 2pm, the Biomedical Library hosted the #IPSAG Lunch Break, in which students provided feedback about the upcoming renovation. 47 students from PSOM, SON, SEAS, Wharton, and SAS registered and/or attended the lunch. The students discussed needs and wants for quiet, collaborative, and wellness spaces. On October 30th, 2018, 44 people from across campus (PSOM, SAS, SEAS, Dental, Wharton, Vet, and more) registered for the Tech 'n' Treat Lunch in the Biomedical Library Conference Room, in which attendees were encouraged to provide feedback about technologies that they would like to see available at the Biomedical, Vet, and Dental Libraries. Rashmi Kumar from the Weingarten Learning Resources Center also stopped by to get feedback about a new study tips campaign, in partnership with the Vet Libraries. Also, attendees got a tour of the Biomedical Library's new Relaxation Room, which was set up with almost exclusively via student feedback. On Wednesday August 29th, 2018, #IPSAG held its 2nd Annual Welcome (Back) Lunch at the Biomedical Library. 79 students, staff, and faculty members presenting PSOM, SEAS, SON, Vet, SAS, Wharton, Dental, and Penn Health-Tech registered for the lunch, which was held in the newly renovated space on the Stemmler side of the Biomedical Library. Students talked about their programs, courses, summer plans, study spaces, research experiences, software needs, and e-journal needs. Students were able to get a tour of the Biomedical Library's makerspace. Staff from Penn Health-Tech discussed upcoming interdisciplinary opportunities for students including the Penn Health-Tech Student Ambassadors and Rothber Catalyzer Makerthon. On Thursday March 26th, 2018, IPSAG partnered with Penn Health-Tech and the School of Nursing to hold #ExtremeByDesign at Class of 1978 Pavilion in the Van Pelt-Dietrich Library Center. About 35 students, staff, faculty, and alum from SON, SEAS, PSOM, Wharton, Penn Design, SAS, Vet, and PCI along with clinicians from CHOP and external visitors watched Extreme By Design, a documentary that focuses on health sciences, engineering, business, and design graduate students who are taking an interdisciplinary service learning course at Stanford. In this course, the students use design thinking skills to design and build prototypes for low-cost devices that address health and environmental problems they observe abroad. They discussed their overall impressions of the documentary, their experiences in interdisciplinary teams, and similar opportunities at Penn. Following the panel discussion, undergraduate engineering students, Erica, Julia, and Kate, discussed their impressions of the documentary and experiences in service learning courses at Penn. Afterwards, there were light refreshments served. For a complete list of credentials of the panelists, students, and co-moderators, visit https://www.smore.com/e8mj7. On Monday February 26, 2018, IPSAG partnered with the Student Healthcare Alliance at PEnn (SHAPE), OneHealth, GAPSA, the Medical Student Government, and the School of Nursing Student Government to hold an event titled "Opioid Crisis: Interdisciplinary Perspectives" in the Fagin Hall Auditorium. About 120 students from PSOM, SON, Vet, and SP2 registered for this event. Faculty presenting PSOM, SON, and PennVet discussed the opioid crisis from their points of view as health sciences professionals. The IPSAG BodyViz Demo was held on Monday February 5th, 2018 in the Biomedical Library Conference Room. There were about 15 people in attendance including several folks from Penn Libraries, a faculty member from the School of Nursing, and dental and med students. Everyone provided the BodyViz representative feedback on the immersive anatomy and virtual dissection tool. This feedback will help the Biomedical, Vet, and Dental Libraries decide whether or not to purchase BodyViz or similar tools. The Spring 2018 IPSAG Virtual Reality Anatomy Demo & Lunch was held on Tuesday January 16th in the Biomedical Library Conference Room. There were 30 people in attendance including students and faculty representing Vet, PSOM, Dental Schools along with other health sciences-related programs throughout Penn. Students provided feedback on the Visible Body app, videos, and modules. This feedback will help the Biomedical, Vet, and Dental Libraries decide whether or not to purchase the app. On October 31st from 12pm to 1:30pm, 25 student representing Vet, PSOM, and SON attended the IPSAG Halloween Lunch at the Hill Pavilion, the home of the Vet School Library. Students focused their discussion on OneHealth, the intersection of environmental, animal, and human health. Students also provided suggestions on how to increase increase across the schools via interactive activities and other learning experiences at the Biomedical Library. 2 graduate students attended the Spring 2017 IPSAG Meeting held on April 5th in the Biomedical Library Conference Room. The students represented SAS, the Vet School, and PSOM. The students met with health sciences librarians and Dr. Gregg Lipschik, the Coordinator of InterProfessional Education at PSOM. The group discussed interprofessionalism at Penn in both curriculuar and extracurricular ways. For example, the One Health Initiative provides research funding and lectures geared towards Vet, Med, and Public Health students. Med and BGS students mingle at social events. Health sciences PhD students are encouraged to take courses in each other's programs. There is a lot of overlapping coursework that future clinicians should take together. Some academic buildings restrict access to those only students, staff, and faculty within certain programs and schools, so it can be hard for students to attend events outside of their programs. The group also talked about how graduate students who are participating in research activities would be available for IPSAG breakfasts in Fall 2017. However, the timing may not work out for all students. Students have classes throughout the day. IPSAG may also change its name in the future to be more inclusive. During the second half of the meeting, students provided feedback on the proposed Biomedical Library website such as including mouse-overs that provide additional information about library staff, databases, and widget sections. Students discussed using Browzine, Articles +, Franklin, and FindIt. Reserving a room and accessing the proxy were also things students did when going to the Biomedical Library website. Students will have two weeks to share the new design with other health sciences students and provide additional feedback to librarians. 7 students attended the Spring 2017 IPSAG Lightning Talks held on February 15th in the Biomedical Library Conference Room. Alfredo, a student and research coordinator, talked a virtual reality study that he is involved in. He is looking for more participants and partner organizations. Rebecca, a library intern, discussed her experiences piloting a new library service in the School of Nursing, which led to a larger discussion about libraries, resources, and services. Students gave suggestions on how to strategically implement a satellite reference program (librarians setting up temporary reference desks outside of libraries). We discussed that libraries are awesome study spaces. Librarians are in a great position to help students navigate Penn's many resources and services through one-on-one consultations, orientations, and workshops. The Fall 2016 IPSAG Student Lightning Talks event was held on Wednesday November 9th. 4 students attended representing PSOM and the College. Students shared experiences regarding research projects and library usage. The BGS students discussed research projects along with software needs, thesis writing, data management, and database alerts. A BIBB student talked about the Minority Association of Pre-Health Students (MAPS) and collaborative study spaces. Students gave librarians feedback on book requests and workshop availability. The Fall 2016 IPSAG Reception was held on Wednesday September 14th. 11 students attended representing Vet, Nursing, SAS, SEAS, & Wharton. Students shared summer experiences including mentoring students on campus, working in labs, interning around the world, and completing research projects. Students and librarians conversed about online classes, cool places to visit in Philadelphia, and changes in library spaces. George Lin, a researcher from the Center of Resuscitation Science, shared information regarding a virtual reality study. If you are interested in learning more about the study, please email him at geli@sas.upenn.edu.